As students across the country call for gun control and an end to gun violence, some voices have been noticeably under-represented. Locally, students have been meeting with community members at St. Paul's Episcopal Church in downtown Chattanooga, but many of those students are part of Chattanooga's elite, coming from schools such as Girls Preparatory School, Baylor School and McCallie, and Hamilton County's more affluent middle-class suburban schools. Inner-city students and students of color from communities served by Brainerd High School, Tyner Academy and Howard School are largely missing from those conversations. "We have to make the information of what's happening in Chattanooga available to all students," said Jaime Peterson, an educator at Brainerd High School, who has been plugged into the groups Chattanooga Leading Change and Students Leading Change that were created in the aftermath of the Parkland, Fla., shooting that left 17 dead on Valentine's Day. "In general, for all of the social justice issues, it's harder to get some kids plugged in," Peterson said. "We have these conversations that they have a lot of things to say about." Chris Sands, pastor at Olivet Baptist Church, said the community needs to unite around the issue of gun violence and how it relates to everyone. "It's all about unity. 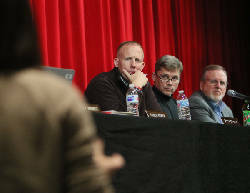 We have to figure out ways to unify our community around these issues," Sands said. "The reason why [the conversation] isn't happening the way it needs to is because it is not happening enough." Sands helped organized a conversation between community members and students at Brainerd on Tuesday, which some who have been attending St. Paul's Sunday meetings also attended. 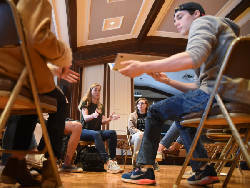 Clay Thomas, a pastor at Rivermont Presbyterian, who first helped bring student leaders together under one roof to start these conversations, said this was his hope all along and has continuously acknowledged that not every community has been represented. "From the get-go, I was hoping that the energy around addressing mass shootings in school would spill out over to addressing gun violence in Chattanooga that affects young people every day here in Chattanooga," Thomas said. Thomas said the push to include inner-city students of color in the conversation isn't just for diversity at face value. "We want Howard, Tyner, Brainerd there to move the conversation beyond the conversation about mass shootings and more about the culture of gun violence," he said. Educators who work in poor schools and communities recognize that gun violence affects their students in a starkly different way than it affects others. "Gun violence is an everyday issue," said Joe Banks, behavioral specialist at Howard. "In this neighborhood, it's a different issue. Where there's poverty, there's violence." Banks said even with heightened awareness about the possibility of school shootings, many of his students feel safer at school than outside of it. "Their world is flipped," he said. "Our kids feel safe at school, and don't always know what's going to happen at home." It's that perspective that is sometimes largely missing from conversations about school violence. At Wednesday's planned student walkouts, many student groups plan to read off the names of the 17 victims of a shooting in Parkland, Fla. Meanwhile, a 21-year-old was gunned down right here in Chattanooga last month, Peterson said. She believes that Cachet Peterson's death hasn't gotten as much attention because it wasn't a school shooting. "But it was still a young person who got killed due to gun violence," Peterson said. "Shootings happen and they affect the entire community, and you see reaction in that community, and it doesn't typically trickle out of that community," she said. "We assume that because they are urban kids, they are somehow stronger. It wrecks them and it wrecks their community in the same way that it wrecked the Parkland victims." Brandon Woodruff, a community member who has been attending the meetings at St. Paul's, believes it takes resources to empower inner-city kids the same way as students with means. 'It's going to take resources to get inner-city kids who experience gun violence on a daily basis to the table," he said. "The conversation has to shift from mere safety and protection of schools to a broader conversation of safety and protection of people." Woodruff is currently running for the District 28 seat of the Tennessee House of Representatives. Like many of the adult leaders watching the youth movement take off in Chattanooga and nationwide, he is encouraged by the energy. "Don't think it's by mistake that the catalyst for greater gun control is led by our babies, by our young people," he said. "When we look at our history, every great movement, every great revolution, was led by young people." Thomas, Sands and other community members plan to meet with students at Howard today. The next Students Leading Change community meeting is at 3 p.m. on Sunday, March 18. This week it will be at the King Center at 730 East M.L. King Blvd. Correction: This story has been corrected to show Clay Thomas is officially a pastor at Rivermont Presbyterian, not St. Paul's.